ENERIK Ltd. is an official distributor of the German company STEFFEL KKS in the field of cathodic protection. - Complete solutions in the field of cathodic protection. - Automatic and semi-automatic CP stations. At the beginning of 2018 ENERIK Ltd. completed successfully the implementation of a program for complete modernization of 34 CP stations with the STEFFEL KKS equipment, which support the electrochemical corrosion protection system of the main product line from Neftochim Bourgas to Sofia with a length of 402 km. 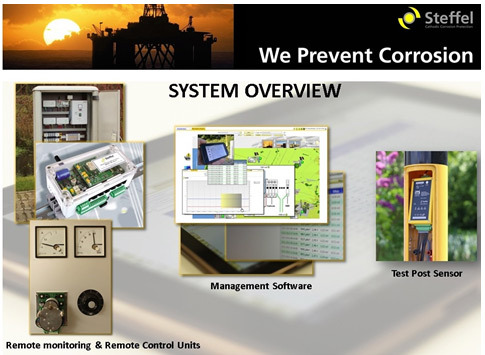 Ability to monitor the function and effectiveness of the corrosion protection systems at any time. Recording of the relevant measured values, which allows easy and immediate detection of errors in the CP operation. Generating data in tabular or graphical form with export functions e.g. to Excel or PDF. Central database software with web-based access to the system. Regular manual measurements become largely redundant, which reduces total cost of the CP.